The Bira circuit outside Pattaya is the venue for this next round of the Asian Festival of Speed (AFOS), which is being held in conjunction with the local Thailand Super Car series. There will be three rounds of the Asian Touring Car Series over the weekend, as well as three rounds of the Formula BMW Asia, with local Formula BMW driver James Grunwell right up in the top three. Grunwell wants to do well in front of his ‘home’ crowd. Grunwell who, despite his English/Dutch parentage, grew up in Bangkok, speaks Thai fluently and considers himself a true Thai, also believes that rapid growth in the karting scene, and a greater understanding of commercial sports sponsorship will help youngsters make the transition to competing outside their native country. “As well as BMW Motorsport, I’m also very fortunate to have the support of the Pizza Company. The owner is a racing driver himself (Bill Heinecke) who competes internationally and he and his company really understand the value of sponsorship,” says 17 year old James. The challenges, Grunwell believes, are mainly that no Thai in recent years has made a full career of motor racing, and many do not yet accept the sport as a bona fide profession. This, coupled with the strong tradition of family, has meant many youngsters are reluctant to spend time outside their country. However, Grunwell is upbeat that this will change, “Somebody has to make it, and that somebody could be me!” With six podium finishes so far this season, currently 3rd in the overall Driver Classification and 2nd in the Rookie Cup standings, there is no reason to doubt him. Having known this young man for a few years, I do believe he has the talent. All he needs is experience, and this is something that this first year in this formula is giving him. 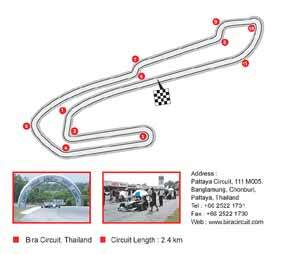 The Bira circuit was named after Prince Bira and built on 65 acres of land and as well as the full scale 2.4 km circuit, it boasts a professional go-kart track at which the Thailand 24 hour event was run successfully. There are also various facilities provided for other motor sport activities, including running weekend racing schools, practice sessions, car tests and other related activities. It is located just 20 kilometers from Pattaya City on Highway 36 and is an hours quick drive from Bangkok. The Asian Festival Of Speed has made it a permanent part of their racing calendar since its first appearance there in 1997 with the South East Asia Touring Car Zone Challenge and the Asian Formula 2000 Series (AF2000). Subsequently, the motor sport fans in Thailand were able to see races such as Formula BMW Asia, Porsche Carrera Cup Asia and the Asian Touring Car Championship. With sales of its Cayenne SUV slowing and a restyled model on the way, Porsche has decided to skip the 2007 model year rather than offer run-out specials. Dealers must sell 2006 models of the Cayenne until the 2008 model debuts in early 2007 after a midcycle update. Harling says Porsche will skip the 2007 model year because it doesn’t want “to confuse our customers with a short-lived or abbreviated model year.” And if you believe that you will also believe that the moon is made of cheese. There has been no positive movement in the SUV market in America, even at the upper end where the Cayenne sits. Last year US sales fell 24.9 percent, to 13,607 units. In the first seven months of 2006, Porsche has sold 6,629 Cayennes, down 14.3 percent from 7,735 a year earlier. Porsche can see the numbers on the wall and does not want to be left with unsold Cayennes. 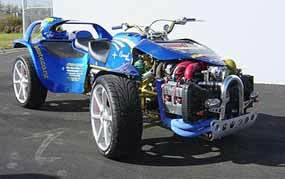 Here it is, the ultimate quad bike has hit the streets in New Zealand. The country that bred such wonderful eccentrics as Burt Munro (World’s Fastest Indian and if you haven’t seen the movie, grab the DVD) has also spawned a Ken Brough who has made the world’s fastest quad bike. This particular toy has a turbocharged Subaru Impreza STi as motive power and retains the Subaru AWD as well. So instead of a comfortable four door, four wheel drive, four place family rocket, our Ken has made an uncomfortable, one person, suicide mission rocket. This is the kind of device you would expect to see in Mission Impossible IV, but it’s here and now and living in New Zealand! Ken Brough filled his spare time building this thing, and his reasoning for it? “Why not?” However, people have climbed Mt. Everest for sillier reasons. The 230 bhp turbocharged boxer engine in the 530 kg quad has a power-to-weight ratio of 434 bhp per tonne, enough to make the super ATV do wheel stands with a flick of the wrist. And you probably need Super-Glue on your backside to stay on the thing. Since Ken believes he is not the only nutter out there in the EnZed pastures, he is prepared to make you one as well. No price was quoted in the report, but I suggest you start getting fit first before booking your flight to the Land of the Long White Cloud (NZ)! It looks as if it would be quite a handful! What did we learn from the GP in Turkey? First off, it was a good race, there was passing on the track and a nail-biting finish. Two great GPs in a row! Let us hope that the Italian GP will be as good on September 10. Well there certainly was some Turkish delight for Felipe Massa, who capped off his first F1 pole with his first F1 win. And he won it fair and square. He was never headed after his pole position and cruised through to the end. A superb performance from the driver that many thought was only at Ferrari as a ‘make weight’ until somebody better came along. He has definitely come a long way under the encouragement of Jean Todt. The McLaren Mercedes team did not fare so well, both in qualifying and the race, and Raikkonen looks to me as if he has given up trying in the car. Reading between the lines, it would seem that McLaren Mercedes have also given up on Raikkonen. Norbert Haug saying, “It’s a pity for Kimi – the crash at the first corner was not his fault, but if you start lower down the grid you are in danger of such incidents.” Norbert expected better from Kimi in qualifying it seems. I think Haug, who is getting larger each GP, is wishing to take on the mantle of the great Mercedes team manager Alfred Neubauer. I would not be surprised to see MB take the majority shareholding in the team, and Ron Dennis taking a backwards step. Where will Kimi go in 2007? Try Renault. It makes more sense. Jenson Button showed that the win in Hungary really was a fluke, as despite finishing fourth, he was really nowhere near the Ferraris or Alonso’s Renault. Barichello showed once again why he is a number 2 driver. I think he is rapidly reaching his ‘use by’ date. Honda will have got as many secrets as they can from the ex-Ferrari driver, and he certainly is not much use to them as far as scoring points is concerned. In another of the retro cars, GM are bringing back the Camaro, one of the best styled designs of the 1970’s. General Motors will build the new Chevrolet Camaro at its Oshawa, Ontario, plant. Early production versions of the car will be produced by the end of 2008, with sales starting in the first quarter of 2009. GM will begin preparing the plant immediately and will invest $740 million Canadian ($657.7 million US) in the program and conversion of the plant to a flexible manufacturing factory, GM said in a statement. GM chose the Oshawa plant because of its strong relationships with the Canadian Auto Workers and federal, provincial and local governments, said Arturo Elias, president of GM Canada, in a statement. Oshawa also has a reputation for “the industry’s best quality and productivity,” Elias added. “Earning the mandate for the new Camaro is a huge accomplishment and is due in part to the reputation of our members for producing great quality vehicles,” said Buzz Hargrove, CAW president, in a statement. He said CAW Local 222 has offered an “innovative local agreement” that helped build a viable business case for the Camaro. 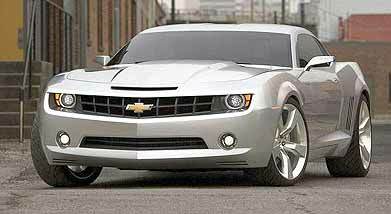 GM unveiled a concept version of the Camaro at the Detroit auto show in January this year. This month, GM said it would build a production version of the vehicle. GM executives say the production vehicle will strongly resemble the concept car. “The interiors will actually be better on the production version,” said GM CEO Rick Wagoner during an event on Friday, Aug. 18. Wagoner said the goal is to keep the exterior design intact, have a great price point and a great powertrain. Wagoner declined to say if Pontiac might receive a similar product or perhaps revive the Firebird, but hinted that John Larson, GM’s general manager of Buick, Pontiac and GMC, is pushing for it. Last week I mentioned that a transverse engined V4 front wheel drive GP car ran in 1907. I asked what was it? The correct answer was that it was the WC1, built by a Walter Christie. This FWD monster had a 19.8 liter transverse engine. By the way, the first FWD vehicle to win a race was also a Christie at Daytona Beach in 1907. I am not sure if it were the same car. So to this week. I mentioned the new Camaro, but think back to the first Z28 Camaros. What was it that identified the Z28, over the more humble Camaros?